LinkedIn is an exceptional networking tool that boosts over 430 million people. Many people don’t take advantage of the social platform created to boost your network. I’ve been granted multiple opportunities from LinkedIn and you can too. Before you network, you need to be sure to have a strong LinkedIn presence. People are more likely to network with people with a profile picture and a little background about them on their profile. Pay attention to the strength scale on LinkedIn that lets you know how strong your profile is. The site is set up to help you win! Are you relocating? Want to join organizations to network? LinkedIn lets you browse different groups and organizations to be a part of. For example, if you are relocating from LA to Atlanta, just type in your industry in Atlanta and you will receive options pertaining to groups specific to your industry in Atlanta. There are many groups out there that post opportunities and host networking events. Take advantage of what is right in front of you! My name is [your name], and I’m a [job title] who works in [your location]. I’m reaching out because [reason why you want to speak with this person]. I’d love to learn more about [two or three things you’d like to learn from the person]. I’m sure you’re busy, so even 20 minutes would be appreciated. Be sure to follow up with them! Getting published on LinkedIn is a great way to grow your network and receive views on your page. People are always reading articles on LinkedIn and it gives you an opportunity to showcase your writing skills. I’ve had people message me about articles I’ve written in the past. It’s a great way to get noticed and grow your network! Are you a writer? Content Creator? Add these buzz words to your profile so people can find you. If you aren’t marketing yourself, you are making it hard for you to be found. Your LinkedIn URL is a great way to brand yourself. Be sure to personalize it. If you put this in your email signature, it will make it a lot easier for people to connect with you. 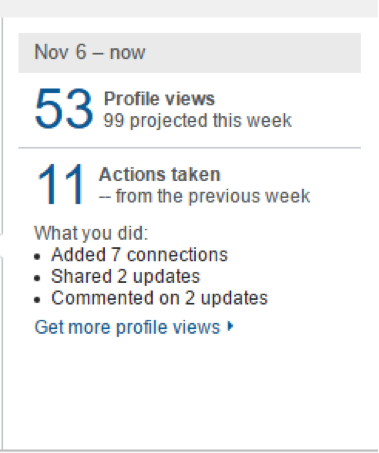 One reason I love LinkedIn is because it will tell you why people are looking at your profile and what caused incoming traffic. Posting updates and sharing photos cause people to stumble across your page. You can have someone view your page just because you liked a picture or shared a photo that someone else has a common interest in. Pay attention to the feedback this social platform is telling you. Why are you connecting with someone? What is your ultimate career goal? Be sure that your LinkedIn page is concise and can tell a story. When your goal is clear, people are more willing to help you get where you want to be. These are the eight ways to grow your network on LinkedIn all in the comfort of your home. Take advantage of the tools you have. Many people did not have LinkedIn back in the day so use your resources to help you land your next gig or job! Happy networking!